When you’ve got a business, the point is to get paid, right? There are all sorts of different ways to receive payments these days, some more efficient than others. Would you rather wait for a check in the mail, or receive an electronic deposit right to your bank account? Seems like a no-brainer! Here’s some great info on payment companies for businesses of all sizes. There are quite a few options when it comes to processing credit card payments, which is one of the quickest and easiest ways to get paid. Let’s start with our own credit card processing feature (partially, because this is our blog and partially because it’s a really good price). With ZipBooks you can accept credit cards easily for 2.9% or 3.4% with AMEX. Process payments domestically or internationally, and, the best part is, we help you with everything else you need to run a successful business. Invoicing, accounting, reporting, tracking time, recording contacts, and on and on. So, ZipBooks is pretty much the best. We think it’s the only one you need to check out on this list, but we’ll go ahead and give you all the options so you can compare. 2Checkout is a company in Columbus, Ohio, and they’ve been around for almost a decade. They serve around 50,000 different merchants, are PCI compliant, and they claim to have the highest level of protection in the industry. Their pricing is 2.9% plus 30 cents per successful transaction. But they also have volume discounts if you process more than $50,000 a month. However, this isn’t a very good option if you’re doing a lot of international business. If someone is paying you internationally, there’s actually an additional 1% fee, and they do also charge you 20$ for every charge back. They also charge you pretty heavily for a currency exchange fee. But, like ZipBooks, there’s also no monthly or setup fee. 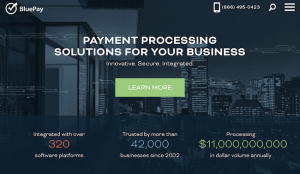 Aliant Payments is a credit card processing company that’s been around for 20 years. 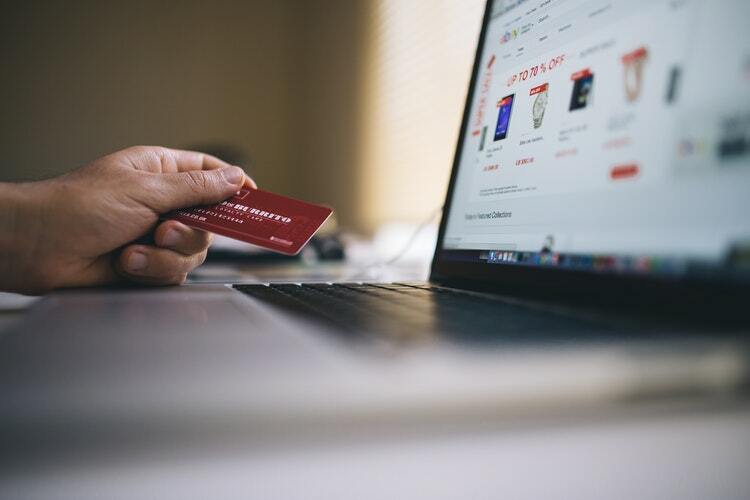 Basically, they are an intermittent merchant services provider that gives you the ability to do point-of-sale credit card processing, but their niche is focusing on high risk merchant industries around the world. So, if you have a higher risk business (like fire arms sales, for example), Alliant can help you keep costs down, and help you monitor for fraud more effectively than a company who doesn’t specifically cater to high-risk situations. Aliant doesn’t list their processing fees on the site, but they provide a form for you to fill out so they can contact you. Amazon Payments is a processing option through Amazon.com. It allows you to accept payments online for your Amazon Store. Their pricing is 2.9% plus 30 cents and 3.9% ($20 charge back) for anywhere outside the United States. They also charge a 30 cent authorization fee plus 2.9% for charges inside the United States. However, their site doesn’t say anything about fraud detection. Ariba Pay is more sophisticated in that they provide things like supply chain management software and collaborative commerce solutions. They are a whole network of support, risk management, organizational, and commerce professionals (among many other things), and their payment processing is based on B2B sales, more than sales to consumers. Contact them for more details. Authorize.net is a well-known online and mobile merchant solution. They allow you to process credit cards over the telephone or by mail. Like Authorize.net ZipBooks does payment processing and recurring billing. Unlike ZipBooks, Authorize.net charges $50 for setup and $25 a month for a payment gateway, plus the processing for each transaction. ZipBooks is competitive at 2.9% plus 30 cents, with no setup or monthly fee. If you don’t need e-checks or ACH then ZipBooks may be a better solution than Authorize.net. Beacon Payments offers the ability to make payments via your phone, along with credit card and point of sale terminals. Their rates are competitive, but they don’t state them upfront. To compare, ZipBooks has an iPhone app, which allows you to process credit cards and do online payments through a web interface or your phone. Or you can send an invoice from your iPhone that allows customers to pay via credit card right from the invoice. And our processing fees are only 2.9% plus 30 cents. Plus, Beacon Payments does not offer you all the bells and whistles that we include, like reporting, time tracking, and recurring billing. Bell ID has a lot of solutions for people who want to increase their ability to charge via mobile app. Their technology is a little bit more sophisticated for phone integration purposes. But as far as actually getting paid, there’s no real difference between Bell ID and ZipBooks. However, with Bell ID you may have to find a solution provider who uses them, because Bell ID doesn’t offer any kind of direct customer service. Best Card Payments provides credit card and check processing, online invoicing, and other services like business loans. When comparing ZipBooks to Best Card Payments, you’ll find that we have some comparable services, although ZipBooks offers a full business system, with many of the features starting at free. Best Card Payments doesn’t offer pricing up front, so just fill out their online form to get a quote. 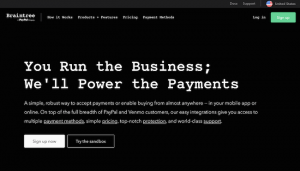 Bill.com is a well-known digital business payment provider. 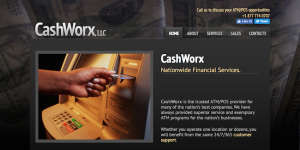 They do both accounts receivable and accounts payable solutions. Their pricing is essentially a monthly fee, which includes access to their whole platform. For $29 a month you can import/export your accounts payable and accounts receivables and manage users. The pricing goes up to $39 a month for full integration. Right now ZipBooks focuses most on getting you paid. However, we’ll be adding accounts receivable capabilities soon. You’ll be able to print checks, send purchase orders, etc. As far as credit card processing with Bill.com, on average you’ll pay about 3%, plus the monthly fee. Bitcoin is a cryptocurrency that can be compared to buying tokens at an arcade. You trade real currency for tokens, and then use the tokens to play the games. You can open a Bitcoin wallet, purchase Bitcoins, and then buy things from people who accept Bitcoin payment. 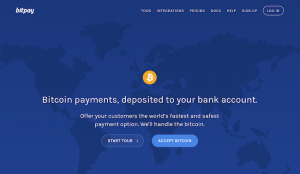 BitPay allows you to deposit Bitcoin payments into a bank account. and convert your Bitcoins into dollars. One of the biggest advantages of accepting Bitcoin payments is security. You won’t be storing customers’ payment info and having to deal with fraud. ZipBooks doesn’t currently accept Bitcoin payments, but we may in the future. 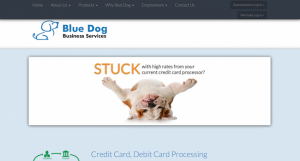 Blue Dog Business Services is just another small business credit card and debit card processor, but they let you process cards in many different countries. Also, they do Apple Pay processing, provide some mobile solutions, automatic checking deposits, and check conversion. As far as pricing goes, they claim to have competitive rates, but you don’t actually know until you submit a quote. BluePay also has lots of different payment solutions. They do batch credit card processing for large ticket items without a limit on the dollar amount you can do per charge. But they don’t provide other business accounting solutions. ZipBooks can process large purchases as well. If it’s in the hundreds of thousands of dollars as a credit card payment, you’ll probably want to give us a heads up. But ZipBooks essentially does everything BluePay does with the exception of point of sale. You can get much better rates when you have the card present during processing. 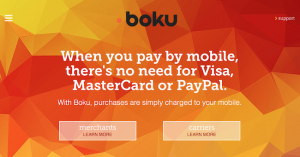 Boku is currently the largest independent carrier building company. They’re in over 60 countries and process payments primarily via mobile phones. However, they only provide mobile payment solutions, which is a little bit limiting. At ZipBooks, we do more than just mobile, including accounting, invoicing, and time tracking services. Braintree has a worldwide presence and allows you to process payments regardless of your company’s size. Both ZipBooks and Braintree let you set up an easy solution to pay via credit card or PayPal. Braintree allows you to pay with Bitcoin, while we don’t at the moment. And the pricing is 2.9% plus 30 cents for both ZipBooks and Braintree, so there’s no real difference there. 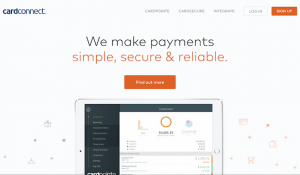 CardConnect claims to have over 50,000 merchant accounts in the United States. They have tokenization and P2PE certification, like most credit card companies do. Both CardConnect and ZipBooks process payments for businesses of all sizes. Both platforms offer payment processing very easily via APIs, so you can send invoices outside of the ZipBooks system and it will still allow you to charge credit cards. But CardConnect doesn’t offer the additional services that ZipBooks does.